Audio recording of interview from 24 April 1966 tank sighting located, sighting occurred at Puckapunyal Army base, near Seymour, some 70 miles out of Melbourne. The recording is of a Victorian researcher, speaking of an interview they conducted with a Captain in the Australian Army Legal Corps That Captain was at the Puckapunyal Army base, present as an observer at an Army exercise. At around 2am on 24 April 1966, seven Centurion tanks were on a firing range, firing shells at stationary targets on a hill, illuminated by flares. 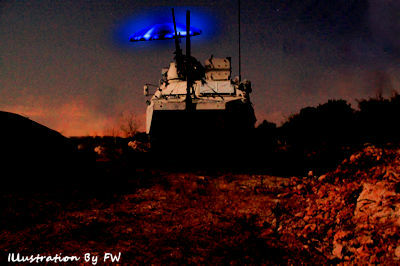 While the tanks were firing, suddenly a UFO rose from "dead ground" about 700 yards away. The tanks stopped firing. The object rose up to 60-70 feet above the ground. It then hung in the air, wobbling slightly on its axis. It was dome shaped, and looked like it was made out of bluish metal. There were 23 witnesses in all. The object appeared damaged, as one side looked to be "bashed in" around the rim. There was also a reported "patch of oil" or some other fluid visible on the side which was damaged. The object moved towards the tanks, then stopped at a range of about 150 yards. A diaphragm opened on the near side of the object, looking like the iris of a camera. At this point, one of the tank gunners, turned his gun towards the object. The diaphragm snapped shut, and the object then moved off to the left flank of the tanks. At its closest approach, the object's size was estimated as 45-50 feet across, and its speed equal to that of an Army Cessna observation aircraft. Finally, the object sped away to the west, at high speed and was lost to view. The next day, someone went to view the location from which the object had risen. It was reported that a 10 foot diameter depression was found in the ground. Also found, were traces of oil - engine oil - possibly from one of the tanks.